Ahoy mateys! My William turned 7 this weekend and this is the cake that I made for him. I absolutely love making my kid’s birthday cakes. It is one of those things that I look forward to doing every year. This year, William wanted to be surprised and I am tired of cars, trucks, and airplanes. So, a pirate ship it is! This cake was surprisingly easy to make. The things that make it really cool were the Playmobil pieces that I bought at Toys R Us. Other than baking off some cake layers and making frosting, it was minimal effort on my part. 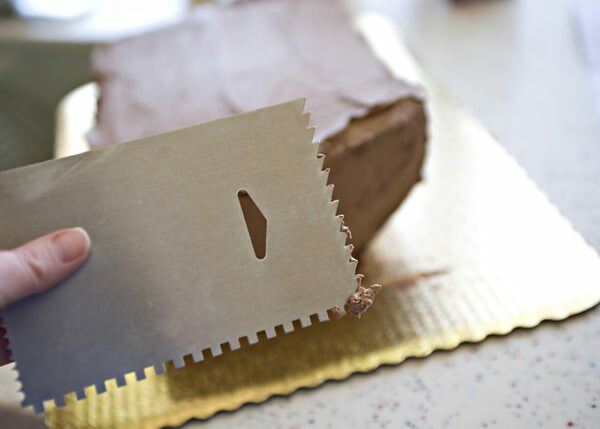 I found this cake from my favorite website for kid parties, Family Fun. Here is my birthday boy. I am so proud to be his mother. I love his sweet nature, creative spirit, and everything about him. I cannot get over that he is 7 already. I made my Beatty’s Chocolate Cake for the chocolate layers and a yellow cake from Smitten Kitchen. I wanted to use chocolate and vanilla to make everyone happy, and I needed to make a fairly large cake. I used 9-inch cake pans and used one and half of the yellow cake layers and one chocolate layer. I made two batches of my chocolate buttercream frosting and had some left over. Cut the layers in half and add frosting to the middle to stick them together. I did this part vertically. I stacked the cake layers on top of each other and used a serrated knife to cut about a half inch off of the round edge so that it would stand better and be more stable. I generously iced the board and then flipped the cake onto the board. As you can see, my layers shifted a bit when I flipped the cake onto the board, but I really liked it. It made it look like the boat was rocking on the waves, so I kept it like that. I inserted 3 wooden skewers through the cake for insurance though. You do not have to ice carefully because we are going to texture it anyway. I used a frosting comb with the ragged edge to go around all of the sides to make it look like wood. That is it for actual cake making. Now for the really fun part. I put Pirouette cookies on the edges to look like railings of the boat. I could not find Waffeletten cookies and did not have enough time to order them online, so I found these chocolate covered marshmallows to use instead. I attached the marshmallows with toothpicks. I put the candles in them as well. I cut a few squares out of card stock and used a small hole punch to make the sails. 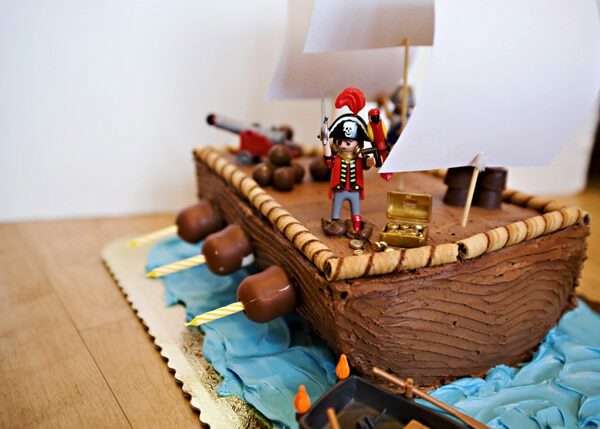 I put the Playmobil pieces around the ship and used Rolos and Whoppers for barrels and cannons. I felt like it needed some color so I colored some canned white frosting and made it look like waves and stuck the boat in the water. William and all of his friends absolutely loved this cake. They really liked the candles coming out of the sides. This cake is one of my most favorite cakes that I have ever made. Are you kidding me? What a great cake! Good work, I’ll have to do themed or shaped cakes some day, I love this! The cake looks amazing and I bet it tasted great too! I love FamilyFun magazine. 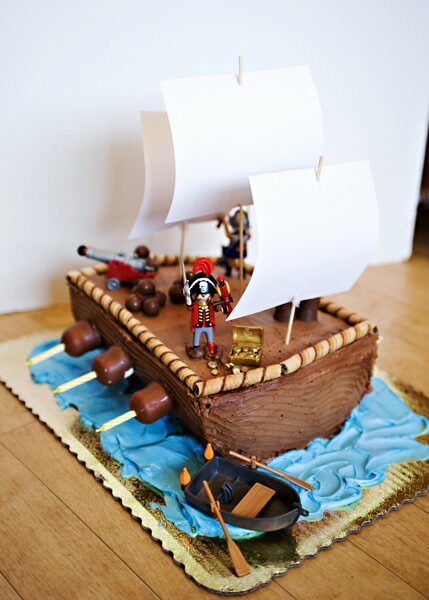 My son Wesley just turned one two weeks ago and my friend made him a pirate ship cake. I just blogged about it the other day. Here’s a link to it https://jennlikesit.com/2011/01/happy-birthday-wesley/. 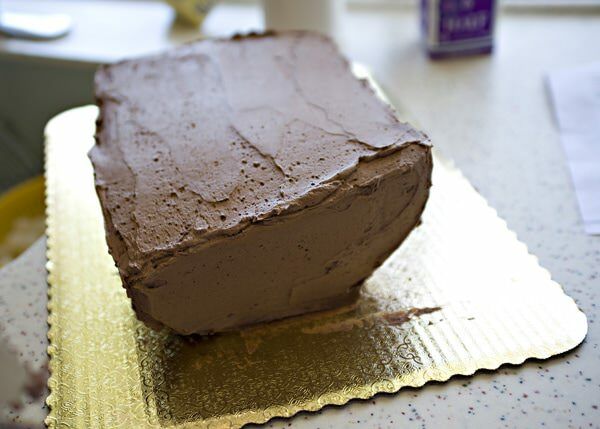 Have you ever made a train cake? My older boy turns 4 in April and I want to have his party at this city park that gives train rides one weekend a month. My husband’s name is Wesley. I have never made a train cake, but I have made a train gingerbread house. Wow! Your cake looks fantastic! I am afraid to decorate cakes becuase I put a lot of effort into them and they end up looking like a 4 year old did them 🙁 I am jealous! Love the way the candle sticks are pointing out! I have had a few of those myself! What a fantastic cake! Love it! I always try to be creative and inventive, but mine never come out as cool as yours! I will keep this one in mind, so perfect for little boys! It took a long time for mine to be cute, believe me! But a cake like this is foolproof. Family Fun is my favorite place to go for kids cakes. They really make it easy. that is an amazing cake! I bet it tasted awesome too. Your son is so adorable! happy birthday William! That is one amazing looking cake. You did a fantastic job on it and really make it look and sound easy. Love it!!! My 5 year old really wants one for his birthday now. Happy belated birthday to William! that’s awesome! 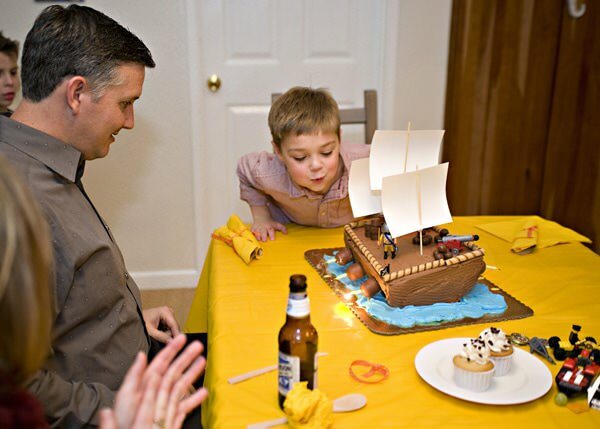 I can’t show my son though, he’s asked for a pirate cake for the past two birthdays. Mine was just a half sheet with an island, palm trees, rocky waters, and a marooned toy ship. Playmobil IS great for this! Your cake looks great!! this was really easy to make. Playmobil did the hard work. That’s saying a lot coming from a twenty-six year old but what a fantastic job! The cake looks gorgeous and I cannot get over the tiny treasure chest! 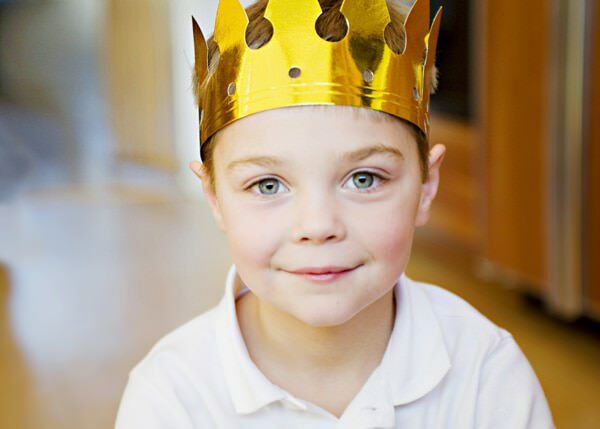 Your son is adorable and I bet he had a great birthday! thank you Amrita! He loved it and it was really fun to make. Thank you Lisa! It was really fun to make. What a cool tattoo! Fantastic cake, so imaginative! I really like the way the boat is tilted a bit, like you said it looks like it’s rocking in the waves. What a cool cake for a birthday at any age! Hope your son had a fantastic birthday. Wow, what an impressive cake!! You make the best stuff but wow this cake is amazing! This cake is terrific! You may have inspired me to try to make a birthday cake for my tot this year. I make cakes all the time, but none of us are wild about frosting, so most aren’t frosted. Thank you for sharing William’s cake with us! It is really fun to make cakes like this. My children love it and remember what I have made year after year. WOW! That cake is amazing! So clever to have the candles coming out of the sides and the waves look perfect!!!! Happy 7th Birthday William!!!! thanks, I cannot take credit, it was all Family Fun’s idea. DYING at how awesome this is. 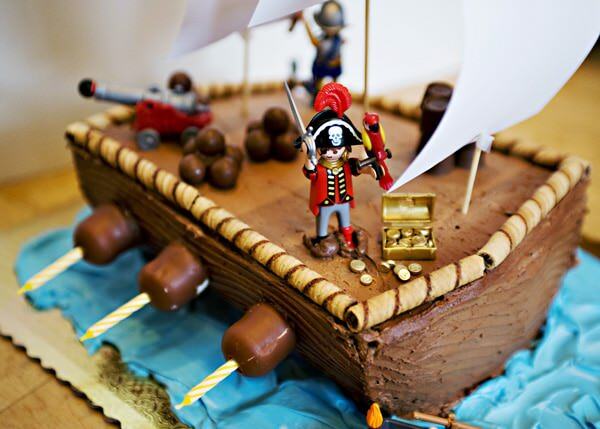 I love kid’s bdays and this cake is perfect for any pirate!! So fun. thanks Marie! It was really easy and so much fun to make. Even more fun was his reaction. He and his friends loved it. well, I know that you could! If I can, anyone can. Absolutely im on your side bakedbree..everybody does! Thanks for the guide – my first attempt at cake making…a real success! My little boy’s first birthday today and it looked great – recommend this one to anyone! I am so glad that it worked for you Nicole! I loved making my son this cake. Great tutorial. The Smitten Kitchen link isn’t linking to Smitten Kitchen. FYI. Thanks for sharing your talents! thanks for letting me know. It may have moved. Nice cake. Although I hate to be a downer. Those toys have been known to contain traces of lead. Not the best thing to have on a cake! Very cute! I’m going to attempt this for my son’s 4th birthday party this weekend. Wish me luck! What a cute cake! You are so talented Bree! This looks amazing and I am going to try to follow your instructions and make one for my son’s fourth birthday this week. Just wondered what sized cake board you needed to use ? Thanks! I made this cake 3 years ago, so I cannot say 100%, but I think that it is 12×18. Totally copied this today, just wanted to say thank you! I hope that your pirate had a Happy Birthday!